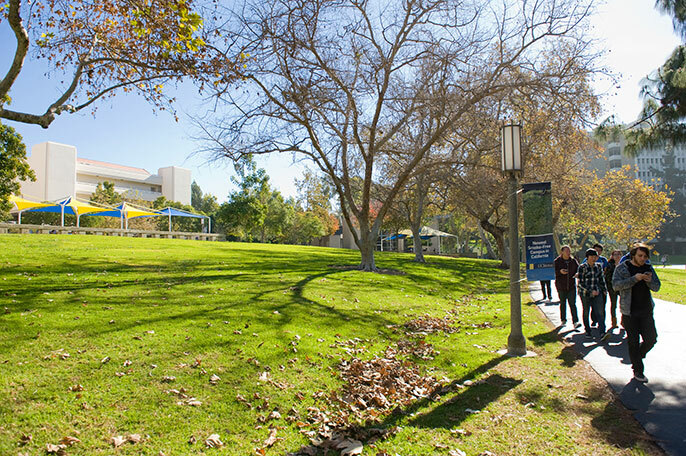 Artist Kathleen Deck is using the landscaping at UC Irvine to start a discussion about climate change. The UC Office of the President allocated $7,500 to each UC campus, the division of Agriculture and Natural Resources, and Lawrence Berkeley National Lab to help fund one-year fellowships. The program's goal is to galvanize student participation in UC's effort to achieve carbon neutrality by 2025. Within days of shutting off the sprinklers, the lush grass will wither and turn brown, and that’s exactly what UC Irvine art student Kathleen Deck wants to happen. For her “Conservation Through Creation” art installation, a 7,800-square-foot section of lawn on UC Irvine’s Ring Road won’t be watered for a month. The idea is to return an artificial environment to its natural state, and start a discussion about how the changing climate can affect water use and the fragile environment that people have created. Deck is one of 37 students awarded a President’s Carbon Neutrality Initiative Fellowship to work on projects that support the University of California system’s goal to produce zero-net greenhouse gas emissions by 2025. UC President Janet Napolitano created the fellowships as a way to encourage student involvement in advancing UC's carbon neutrality and sustainability goals. Fellows have taken on a wide range of projects, from research aimed at scientific advances to policy analysis. And at least one fellow at each UC location is dedicated to communicating the urgency of the carbon neutrality goal to students and campus communities. Communication and engagement is an essential component to whether UC will achieve its carbon neutrality goals, Deck and others said. People need to change their mindset and take personal responsibility for solutions that can address climate change. Deck said she hopes that seeing a brown patch amid a sea of green will be so startling that it forces people to change their perspective. When the project is installed in May, the parched lawn will include a sign noting that it typically takes about 5,000 of gallons of reclaimed water per week to irrigate the site. Deck, an art major who almost majored in earth sciences, applied for the fellowship because she is interested in the intersection of art and science. She believes art has the power to ignite student interest in efforts to combat climate change.